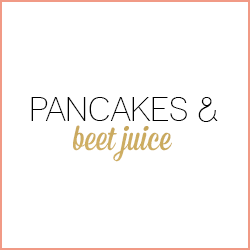 Editor's Note: As you may have noticed from the lack of inappropriate humor or musings from my hippie high horse hitting your inbox each morning, Pancakes & Beet Juice took a brief, impromptu summer hiatus, due to crazy real-life work commitments and the fact that my only adventures of late have consisted of what you will see below and trying to find a way to get grout out of my yoga pants. Thank you for your cries of agony while you refreshed your email waiting to hear what I would say next, as I need to feel needed. I am so happy to be back! 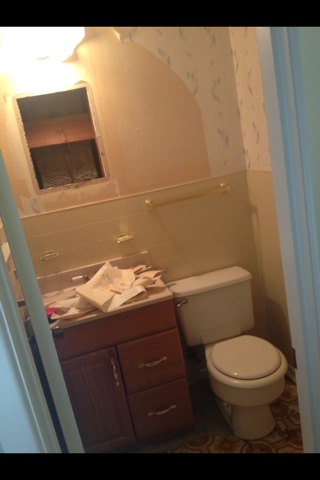 When we purchased our home three years ago, I dreamt of having a powder bathroom off of our master bedroom that could not be used to film scenes for either Law & Order or Breaking Bad. Unfortunately, that was what we were stuck with for a while. 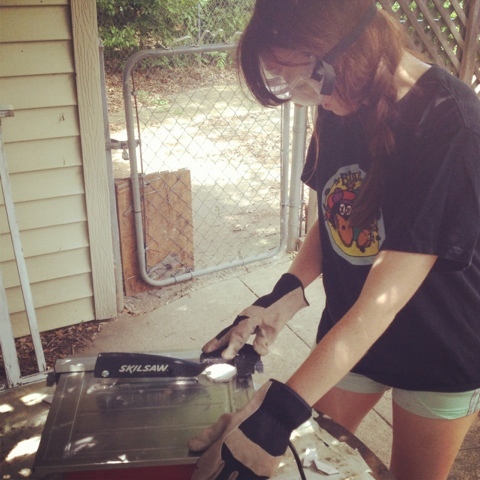 After lots of vision boarding and stashing cash away, I spent the weekend of my 27th birthday sawing, grouting and watching my husband go full out Noah Calhoun, forgoing a morning shave and building me my dream home. What better gift for a girl entering her late 20's than a room that you are not ashamed or afraid to open the door to? 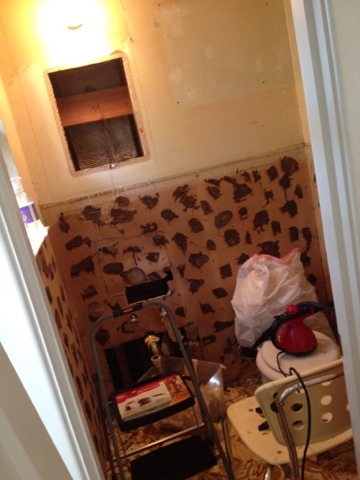 We begin our plumber's fairy tale with a builder's grade bathroom. When we moved in, we ripped out a sea of blue carpet. Most of the rooms revealed hardwood floors, but in this room we found orange vinyl. Have you ever seen anything so crack-tacular? The crack reference applies to either the making or the smoking of the substance, as either could be executed with flair in such a venue as we see below. I let out my aggression on some wallpaper one day after work. It was stuck on well, much like our previous bathroom makeover, but after borrowing our neighbor's Scunci steamer it started peeling off easily. We took a full day to mix the mortar and lay all of the tile. 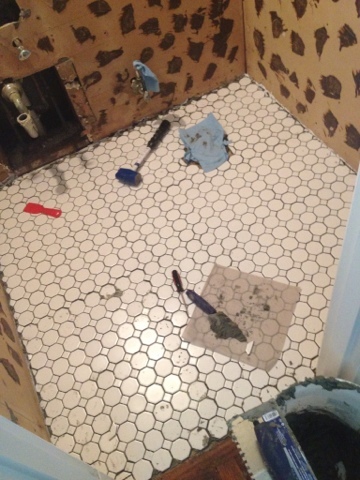 The mosaic tile sheets made spacing a breeze and we never needed to use spacers. We purchased a wet saw at Home Depot for about $90 and snipped some tiles off of the sheets and cut them down to fit the edges and corners using the saw. 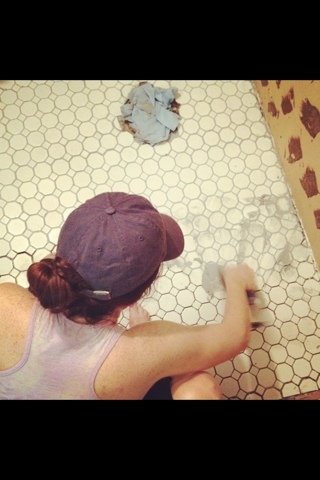 I think my favorite part of the entire bathroom experience was grouting. You start to see it all come together, it's almost idiot proof and it's good for the upper body. 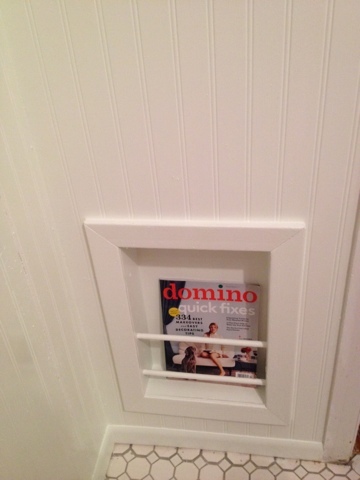 I chose a grey grout to pop against the white tile and stay neutral for future home owners. With that said, after spending so much time on this bathroom project it is unlikely that I will be selling this house before my death. I picture George Banks in front of the wrecking ball in Father of the Bride II. Note: Please don't judge me by my use of the phrase "my man." It is the home project hillbilly coming out in me again. After painting the trim, installing the fixtures and hanging some choice art, the place was really starting to come together! 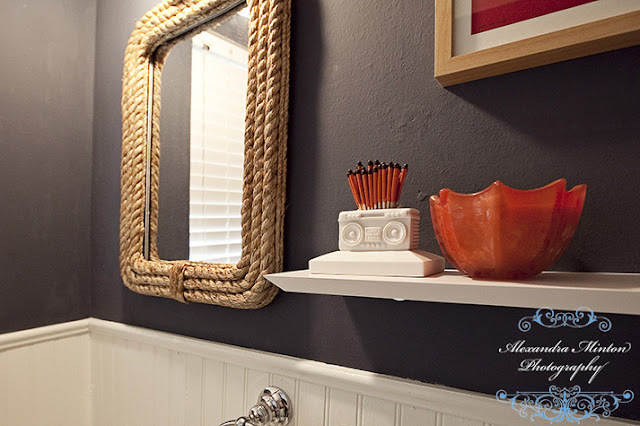 I knew I wanted the room to have a midcentury prep feel, with nautical elements even though I hate theme bathrooms (sailboat art prints with seashell soaps and anchor embroidered hand towels will not be making appearances in the new bathroom). 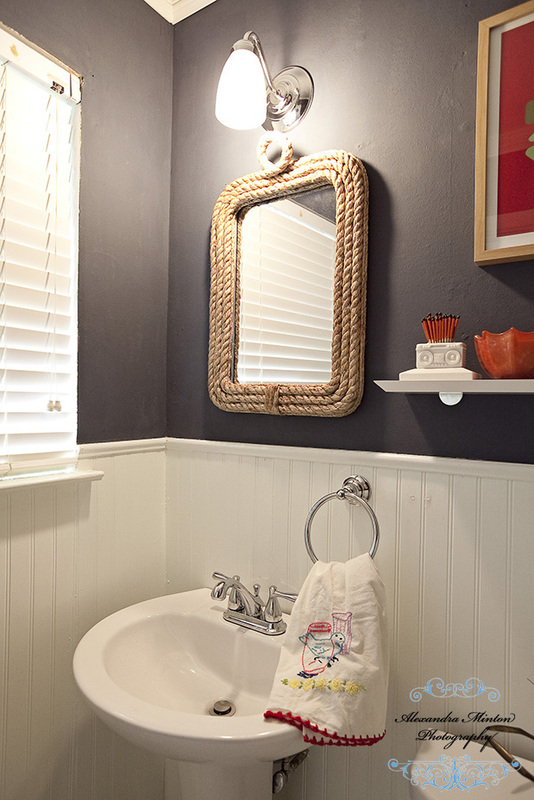 I thought the rope mirror, polished chrome hardware and navy wall gave the look I was going for without going overboard (overboard?? heh? ...a little nautical bathroom humor). 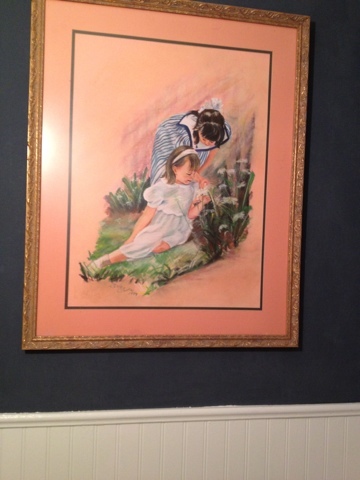 Another preppy, nautical note in the room is the oil drawing of Sistah and I as wee ex-pats that my mom had commissioned when we were living in Ecuador. I tried to match the blue on the walls to the navy stripes on my dress, and I think I did just right by it! Thanks for all the sweet birthday wishes and for bearing with me as I got our bathroom to a place of yes! Update: We were so excited to have Alexandra Minton Photography in Dallas recently snap some photos of our home. (She is also great for weddings, engagements and family photos.) She took some great shots of the itty bitty blue bathroom that I think really show how far the room has come! 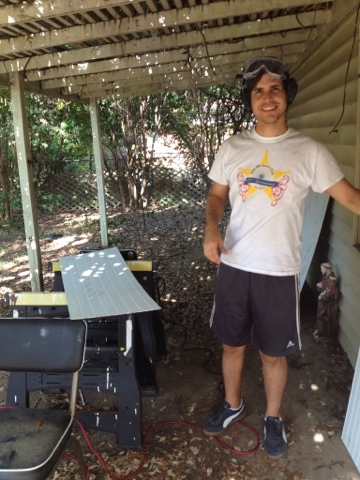 What's the craziest home project you've ever done? Are you a DIY or a hire it out? this is insanely awesome!! I can't believe you and Markus did this without any help..you people crazy. and talented. and skilled. wow!! this is amazing Lilly! I'll be featuring my powder room next week on my blog. Actually, I just started my blog about two weeks ago, so it's new. I'd love it if you came to visit when you get a chance! And congrats on getting featured on YHL! You deserve it! We had that same linoleum in the kitchen growing up. Fond memories of scrubbing that awful orange floor. 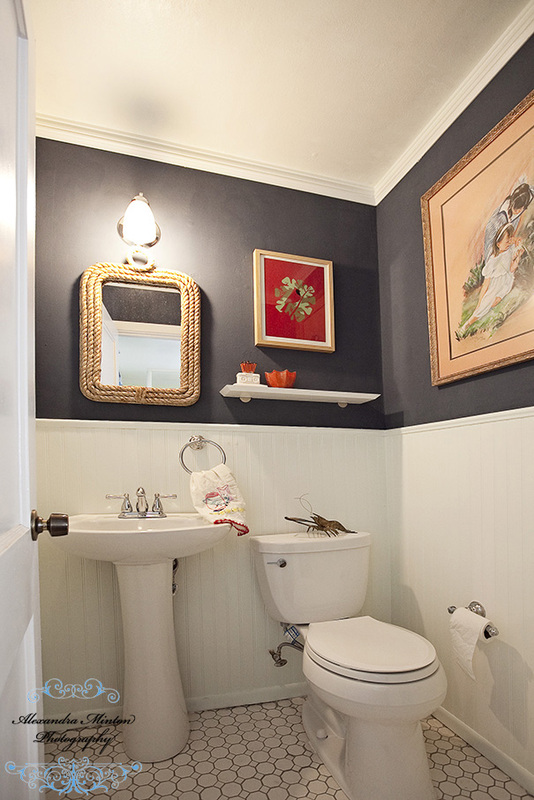 Love your beautiful bathroom. I wish I could be so brave to try tiling myself! Congrats on the YHL feature, too. I mosied on over here after seeing the abbreviated version at YHL. 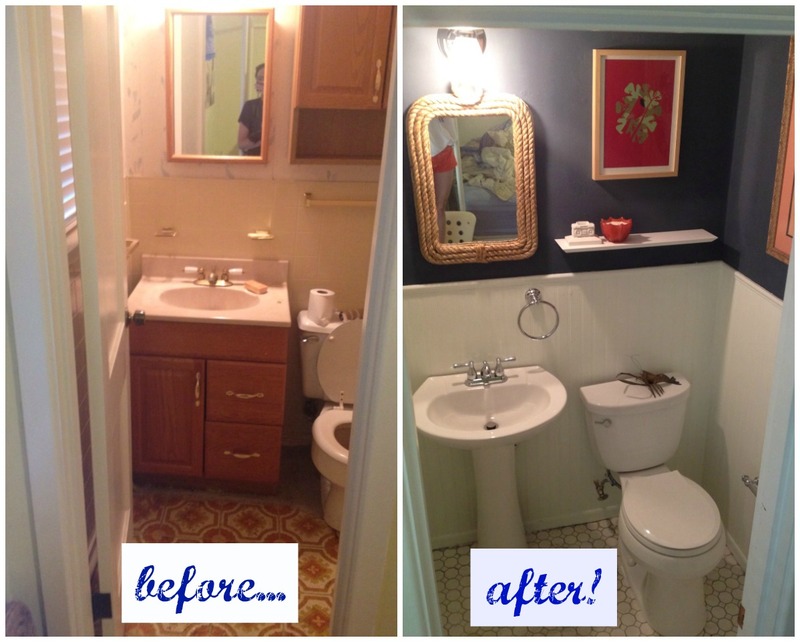 I have a similar project in mind for my own house ... but it is for our tiny main bathroom. I SO want to install a pedestal sink because the wooden sink cabinet we currently have seems to take up so much room! I think nixing it and adding a pedestal sink will make the room seem bigger. We need to redo the floor too! I'm intimidated, but your post gives me hope that it can be done. Thanks for sharing!! Beautiful! I love the mid-century nautical prep look. Brilliant for a small space too. My Mom processes life through online shopping. She and your Grandma should never ever go on Overstock or QVC together. I think the craziest renovation I've experienced first-hand must be our kitchen redo in 1993. We hired out but the company went bankrupt after gutting our kitchen and installing some of the tile (including tiling the dishwasher permanently open). Six weeks later, after the local restaurants knew us by name because we had no kitchen at all, we hired a contractor friend and his team to do the job we wanted. The entire project took about three months. When Christmas rolled around, a couple of the local restaurants gave us table linens and utensils to congratulate us on finally having a kitchen again. Twenty years later the blue checked room feels a little dated but no way we'll change a thing after what we went through! 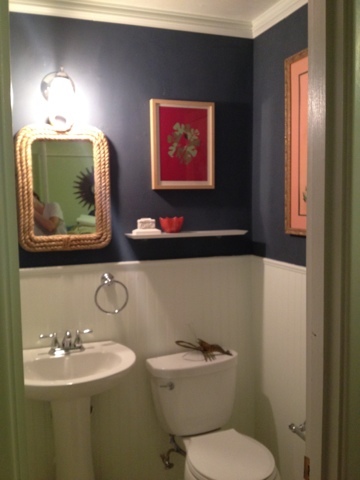 Popped over from YHL, love the bathroom redo! 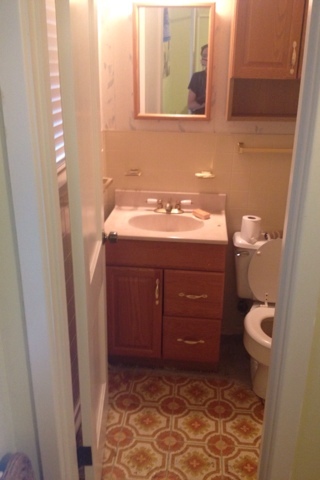 QUESTION: Did you remove the old vinyl flooring or tile over it? I found the blog through YHL as well! Love the nautical mid-century (yet not "over board")theme! Our home is mid-century/prep (built in 1948)so we're in the same boat (sorry for the pun) =) We'll have to link up and share inspiration. Anyway love it! 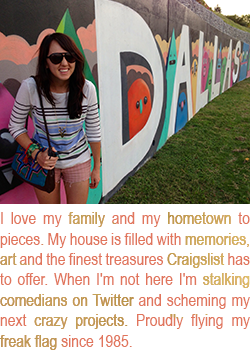 Lilly, so excited to see you featured on YHL! Way to go!